During the 1960s and 1970s, magazines became an important new site of artistic practice, functioning as an alternative exhibition space for the dematerialized practices of conceptual art. Artists created works expressly for these mass-produced, hand-editioned pages, using the ephemerality and the materiality of the magazine to challenge the conventions of both artistic medium and gallery. In Artists' Magazines, Gwen Allen looks at the most important of these magazines in their heyday (the 1960s to the 1980s) and compiles a comprehensive, illustrated directory of hundreds of others. 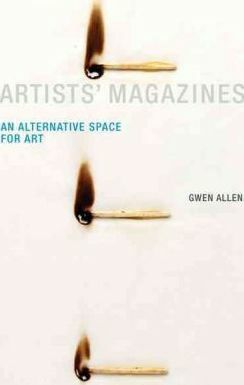 Among the magazines Allen examines are Aspen (1965--1971), a multimedia magazine in a box -- issues included Super-8 films, flexi-disc records, critical writings, artists' postage stamps, and collectible chapbooks; Avalanche (1970-1976), which expressed the countercultural character of the emerging SoHo art community through its interviews and artist-designed contributions; and Real Life (1979-1994), published by Thomas Lawson and Susan Morgan as a forum for the Pictures generation. These and the other magazines Allen examines expressed their differences from mainstream media in both form and content: they cast their homemade, do-it-yourself quality against the slickness of an Artforum, and they created work that defied the formalist orthodoxy of the day. Artists' Magazines, featuring abundant color illustrations of magazine covers and content, offers an essential guide to a little-explored medium. Illustrations note 125 color illus. Gwen Allen is Assistant Professor of Art History at San Francisco State University.